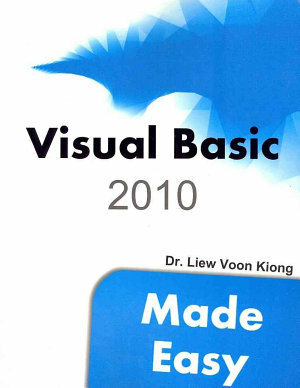 In the previous lesson, you have learned that Visual Basic 2010 is an object oriented programming language. You have understood the meanings of class, object, encapsulation inheritance as well as polymorphism. You have also learned to write some simple programs without much understanding some underlying foundations and theories. In this lesson, you will learn some basic theories about VB2010 programming but we will focus more on learning by doing, i.e. learning by writing programs .I will keep the theories short so that it would not be too difficult for beginners. Visual Basic 2010 is also an event driven programming language. Event driven means the user will decide what to do with the program, whether he/she wants to click the command button, or he/she wants to enter text in a text box, or he/she might wants to close the application and etc. An event is related to an object, it is an incident that happens to the object due to the action of the user , such as a click or pressing a key on the keyboard. A class has events as it creates an instant of a class or an object. When we start a windows application in VB2010 in previous chapters, we will see a default form with the Form1 appears in the IDE, it is actually the Form1 Class that inherits from the Form class System.Windows.Forms.Form, as shown in the Form1 properties window in Figure 5.1. When we click on any part of the form, we will see the code window as shown in Figure 5.2. The is the structure of an event procedure. In this case, the event procedure is to load Form1 and it starts with Private Sub and end with End Sub. This procedure includes the Form1 class and the Load event, and they are bind together with an underscore, i.e. Form_Load. It does nothing other than loading an empty form. You don't have to worry the rest of the stuff at the moment, they will be explained in later lessons. Me.Text = "My First VB2010 Program"
The first line of the code will change the title of the form to My First VB2010 Program, the second line will change the foreground object to Forest Green( in this case, it is a label that you insert into the form and change its name to Foreground) and the last line changes the background to Csyan color. The equal in the code actually is used to assign something to the object, like assigning yellow color to the foreground of the Form1 object (or an instance of Form1). Me is the name given to the Form1 class. We can also call those lines as Statements. So, the actions of the program will depend on the statements entered by the porgrammer.